Tom Sura is an assistant professor of English and the undergraduate writing coordinator at West Virginia University. Tom would love to know if you use one-minute papers in your courses and what discoveries they have led to. You can find him several ways: @tom_sura on Twitter, thomas.sura@mail.wvu.edu on email, and tomsura.tumblr.com online. One of the most powerful tools in a teacher’s toolkit—regardless of the discipline—measures just three inches by five inches. That’s right. The standard-issue index card has a remarkable power for increasing student engagement, assessing pedagogy, and providing evidence of exceptional teaching. When I was in high school, the index card was the primary tool for research. I remember going step by step, carefully recording author names, publication titles, and publisher information on one card before transcribing valuable quotes onto others—one per card—complete with a topic and page number listed at the top. The ubiquity of digital technology has in many ways made this painstaking research process obsolete. Free programs like Zotero (zotero.org) or proprietary ones like Sente (thirdstreetsoftware.com) move this work into the digital age by enabling authors to collect, sort, tag, share, and cite information on a computer. 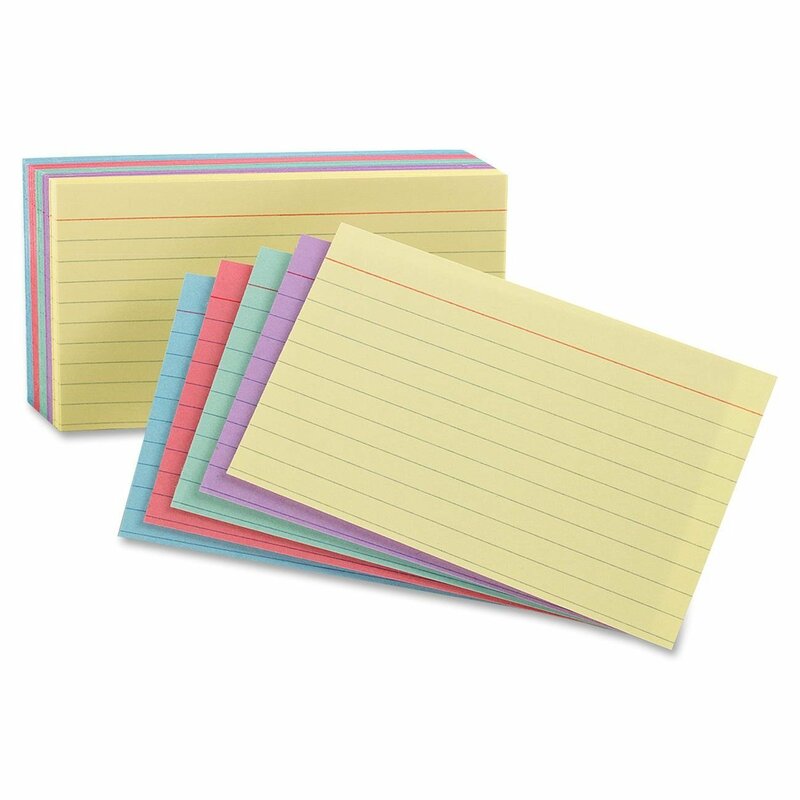 So, in the digital age, what is left for the humble note card? Try the one-minute paper, a form of micro-reflection in the classroom that reveals surprisingly useful information about your course (Chizmar & Ostrosky; Almer et al.). Second, I review the work for next time and any other reminders I need to deliver (again). Third, I ask them to take out an index card and put their names on them. At first, I used to bring the cards myself but now I list them as a required material on my course syllabus. Since students can get 100 for $.99, I don’t feel it’s an undue burden. Fourth, I ask them to write two things on the card: (1) the most important thing they learned that day and (2) one question they still have. I tell them that once they are done they should give me the card, and they are free to go. The last few minutes of class are quiet—meditative even—as students write and reflect on the day. One by one, they come up to the front of the class and hand in their cards. This simple act has initiated an untold number of conversations with students. If I do this regularly, students start to expect it and pay closer attention to the day’s lesson (Savory et al.). I have instant feedback on how the class went. If the majority of students say they learned the thing I was trying to teach, then I can be confident the lesson went well. I will have a list of questions that students may not have asked otherwise. (Because given the choice between dismissal and asking a question, many students would choose the former.) Plus, if several students are asking the same question, I know that might be a good question to review at the beginning of the next class period. I now have simple documents that can make great additions to teaching portfolios, conversation starters for student conferences, or evidence of a student’s participation in class. For example, one student was writing inappropriate lessons and questions on his card each day. When I reminded the class about how the card served as evidence of engagement, making it easy for me to determine a participation grade, the student wrote this: “I learned I need to stop being a wise-acre on these cards if I want a good grade.” Lesson learned. I tried this once, and I was immediately impressed by the results. I started doing it more and more, and now it’s become the standard way I end every class—every time. It works in first-year writing courses, graduate seminars, and even faculty workshops. It can even work in larger, lecture-size courses since it only takes a couple of seconds to read a notecard (Bressoud). If you choose, you can vary the questions and determine how often you want to collect them. When I talk to other teachers about this they often ask, “Yeah, but do the students like it?” The answer: No! Of course not. They groan and groan, sometimes for weeks, until they settle into the routine and begin to see the same value in the cards that I do. In sum, the one-minute paper is a low-stakes reflective writing practice that’s versatile enough to work in just about any educational context. What’s more, once you start you may find yourself becoming more and more curious about what the cards will reveal on a daily basis. After all, your students are the only ones who observe your class every day (Seldin). I’m often so interested in what the students are writing that I’ll read an entire batch of cards on the walk back to my office after class…unless, of course, a student wants to talk about the question he or she wrote down. Almer, Elizabeth Dreike, Kumen Jones, and Cindy Moeckel. “The Impact of One-Minute Papers on Learning in An Introductory Accounting Course.” Issues in Accounting Education 13.3 (1998): 487-95. ABI/Inform. Web. 24 Jul. 2015. Bressoud, David M. “The One-Minute Paper.” Assessment Practices in Undergraduate Mathematics. N.p. : The Mathematical Association of America, 1999. 87-89. MAA.org. Web. 24 Jul. 2015. Chizmar, John F., and Anthony L. Ostrosky. “The One-Minute Paper: Some Empirical Findings.” The Journal of Economic Education 29.1 (January, 1998): 3-10. Taylor and Francis. Web. 25 Jul. 2015. Savory, Paul, Amy Nelson Burnett, and Amy Goodburn. Inquiry Into the College Classroom: A Journey Toward Scholarly Teaching. Bolton, MA: Anker Publishing Co., 2007. Print. Seldin, Peter. “Using Student Feedback to Improve Teaching.” To Improve the Academy 16 (1997): 335-46. Digital Commons @ University of Nebraska-Lincoln. Web. 24 Jul. 2015.